It’s that time of year when the apples are falling from the trees and people begin adding spices to everything. If you’re a fan of Herbst (Autumn) and autumnal foods, then I hope you’ll like this post about traditional German apple sauce – otherwise known as Apfelkompott or Apfelmus. This is the easiest thing in the world to make, and it’s very versatile, too! Apfelkompott is a simple sauce made using apples, water, cinnamon and sugar (and sometimes other spices, lemon, etc). It is sold in big jars or cartons in all German supermarkets. Although apple sauce is hardly restricted to German cuisine, Apfelkompott has always been synonymous with Germany for me, and each time I visited as a child I demanded to eat it (and I still do this now, actually)! It can be eaten warm or cold, with sweet or savoury foods, as a snack, or as part of a larger meal – the possibilities are endless! Kartoffelpuffer are simple potato cakes made from Kartoffel (potato), Mehl (flour) & Eier (eggs). These Kartoffelpuffer are often paired with Apfelkompott for a tasty snack! 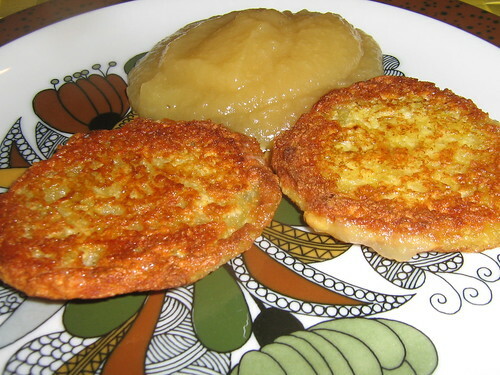 Himmel und Erde is another recipe consisting of Apfelkompott and Kartoffel (potatoes). Its name translates to Heaven and Earth, and it is called this because the apples represent heaven (as they fall from above) and the potatoes represent earth (as they come from the ground). In fact, the 18th Century German word for potato is der Erdapfel – the ‘earth apple’. 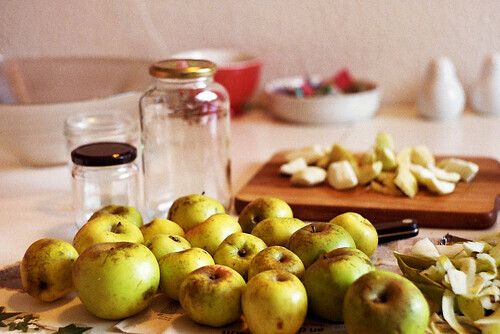 Here is my very easy recipe for making Apfelkompott. You’ll also need a large, glass bowl and a handheld blender. Peel the apples and slice them thinly. Place the slices in your glass bowl. Then add enough cold water to fill half the bowl. Add your sugar and cinnamon (depending on how much you want). Then microwave in 5 minute intervals, checking after each 5 minutes to see how soft the apples are. Mash them with a fork to test this. When they are soft enough, leave the Apfelkompott to cool a little before using a handheld blender to create a smooth texture. Eat warm or cold! Sounds great! Can you post a recipe for the Kartoffelpuffer? I’ll trade you for a delicious apfel-vanille clafoutis recipe! When I read that tidbit about the 18th century word for potato, it reminded me of the Penn Dutch word for it–Grummbier. I thought, maybe, it meant ground berry, but I looked it up and it literally translates to crooked pear.